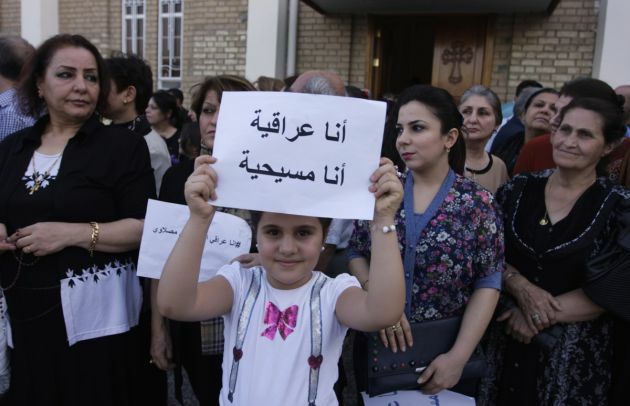 (Photo: REUTERS / Ahmed Malik)A girl holds up a sign that reads: "I am an Iraqi, I am a Christian" at Mar Girgis Church in Baghdad, July 20, 2014. The head of Iraq's largest church said on Sunday that Islamic State militants who drove Christians out of Mosul were worse than Mongol leader Genghis Khan and his grandson Hulagu who ransacked medieval Baghdad. Chaldean Catholic Patriarch Louis Raphael Sako led a wave of condemnation for the Sunni Islamists who demanded Christians either convert, submit to their radical rule and pay a religious levy or face death by the sword. Sako was speaking at the special church service in east Baghdad where around 200 Muslims joined Christians in solidarity. It was 11:10 in the morning of August 19 when Fr. Benham Benoka received a phone call from an unknown number. The priest from Bartella, a small Christian city near Mosul, could not believe that Pope Francis was on the line. "I was in shock for a few seconds. I looked at the taxi driver to see if it was something like candid camera. It didn't look like it. "Then, I thought it could be a friend playing a joke on me. But I had heard that voice before when I was in an audience with him. It was really the Pope. It was the same voice," he told the Catholic News Agency August 31. Benoka has set up a makeshift clinic near Erbil, which is referred to as the "Emergency tent." It currently serves refugees who have fled the violence waged by the militant Islamic State in surrounding cities. The clinic survives with the help of volunteer doctors and gets funding from specific individuals from Spain, Sweden, and Iraq. The Pope called Father Benoka after he received a letter from the priest. In the letter, the priest described the situation of the people as "miserable, dying, and hungry." "I write you with my tears, because here we are in a valley of darkness in the middle of a great pack of ferocious wolves," he said. The priest also expressed his fear saying that many are dying, especially infants. He asked the pope for blessing to help strengthen and keep them going. In the three-minute phone conversation, the Pope was able to encourage and give hope to Benoka. He expressed his sadness on what was happening and assured the priest that he is praying for them always. The Pope also told him that he has personally sent Cardinal Filoni, prefect of the Congregation for the Evangelization of Peoples, to check on the situation. "Tell everyone that Pope Francis called you. I never forget you and I′ll never leave you," the Pope said. Receiving a call from the Pope greatly encouraged Benoka. For him it felt like, "when you're a kid and you have a problem or an emergency and your Mom and Dad are the first to come to mind because you know they'll defend and protect you. "It was like that, calling the person that could help us the most. I was able to get word through to him, and it felt like this, like a true father."